The Great Ocean Road traverses over 200 km’s of spectacular coastline with jaw-dropping ocean views and ancient rainforests. Our day tours include a visit to the iconic rock formations known as the 12 Apostles as well as time to explore other beautiful beaches and walks. Our sunset tour is timed to see the sun sink into the ocean providing a stunning backdrop to the 12 Apostles at the end of the day. Take some pictures at the historic Great Ocean Road Memorial Arch. Go for a stroll along one of the beautiful beaches and get some sand between your toes. Pass through popular seaside resort towns. Coastal Views Experience world class coastal views as we wind our way along the Great Ocean Road. Go for a pleasant walk through the coastal town of Kennett River, see how many Koalas you can find! Get up close and personal with the friendly beautiful birds; Parrots, Lorikeets and look out for the famous kookaburra. Take a guided bush walk through this very rare, ancient, cool temperate rainforest. You’ll feel dwarfed as you stroll past some of the tallest trees in the world. 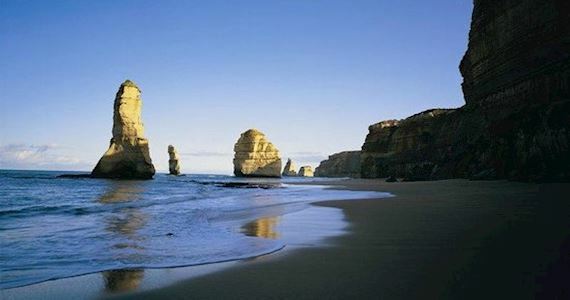 View the beautiful limestone stacks that form the mighty 12 Apostles. Find yourself surrounded by towering limestone cliffs, take a walk along the beach, view the Archway, the Razorback and Dumpling Pots. As we hear the history, romance and heartbreak as our guides re-tell the tale of Australia’s most famous shipwreck!